Lately we've added to Sugester 2 new features that you asked us about at least few times - timesheet export to xls file and tags to VoiP calls. Of course there's more new features or changes in our modules that you should know about. Learn more below! You will need this feature especially when you estimate service costs for a client or make a report of resolved tasks by the end of the month. From now on it will be easier to show this kind of report also to someone, who doesn't use Sugester. In timesheet, just select a period of time, client or a project, for which you want to generate report. System will show you a chart with appropriate data, and you, with only one click on Download xls download it to a file for a client. 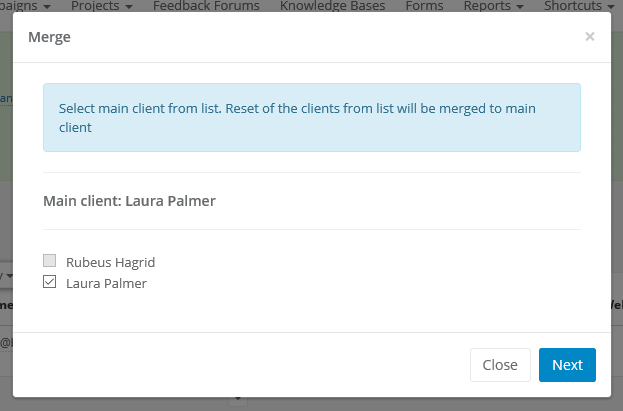 From quite some time Sugester enables you to merge your clients. It's useful feature, eg. when you have 2 records of the same client in your database, because one emplolyee saved full name of the company, and another one - short name, or just wrote the name of te owner. To make your database valid and free of duplicated records, use Merge feature . You will see it on clients' list, by marking clients names with checkbox. Lately we also gave you apportunity to decide, which record will be a main client. This way client's data won't be overwritten, just completed with new information from other merged client. What does it mean? That after you change your Sugester's account name, prefix in your system email box domain helpdesk@ and email boxes addresses, that were under the old domain and were transfered to the new one will be also changed. Also, changes will affect your current forwarding addresses, so you will have to copy the new forwarding address and input it on your email server (eg. if you're using Gmail, do that in Gmail settings), in field for forwarding address. It's necessary, but a one-time operation to make sure your email works properly. Of course this info is dedicated to people, who uses our redirection. We've just reinstated possibility to add priorities in knowledge base's posts. From now one, while adding a new post, you can decide if the order of displayed posts is dependent from adding date or priority. If you select post displaying by priority, note, that each new post by default has the highest priority. However you can change that, by inputting in Priority field appropriate value. If you want a new post to show up at the bottom of the list, just check priority of the last post on the list and add a new post a one-grade lower priority. This way you can manage new posts and decide, which ones should be the most important to your clients and should be on the top of the list. The same rule is with feedback. Here, if you mark in Feedback Settings to display posts by priority, and your client will add a post, not only it will appear on the top of the list, but in inbox you'll see it marked with a red star, as the highest priority. This feature is not new - it exists from quite some time. However, we've added the alert which warns you, that every time you send an email with this feature, the system will create a new client (if the recipient is not in your clients base yet). Even if you didn't enable 'Save every recipient as a new client', a client will be created. The reason it works like that, is because 'Multiple recipients' works like mass mailing, and in this case Sugester always creates new client if he doesn't already exists in clients base.